Here's what I am doing today, fortunately I only have 36 to sharpen. Having a decent sharpener pays off, this is one of those times that you don't want to get the cheapest. 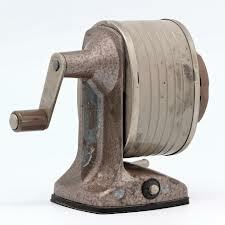 Flashback: This looks like the kind of sharpener that I used in school, no such thing as electric sharpeners. If you are still shopping for school shoes print this coupon for Shoe Carnival, right now you can get Buy One Get One 50% Off plus print this coupon for an additional $5 Off your purchase of $39.98 or more. If you are shopping online enter SAVE5 at checkout. Try Amazon Prime for 30 days totally FREE! This may be a good time to start your Free Trial of Amazon Prime, Amazon Prime members get unlimited FREE two-day shipping with no minimum order size so if you have last minute school supplies or lunch stuff to buy you can get it quick. Prime members can also watch over 40,000 movies and TV episodes, you may be able to cut your cable and save a little money. You also have access to the Kindle Owners' Lending Library. Try it for 30 days, it's only $79 per year if you want to keep it.....super handy during Christmas time!!! Here's another good one!!! Click below to print a coupon for $1 off Sparkle Paper Towels. Print this $2 Off Aleve Coupon, click on the banner below. This is a good one!!!! Click to print this awesome back to school coupon from Famous Footwear. BOGO 1/2 Off plus Rewards members take an additional 20% off, non members take an additional 15% off, valid 8/18 - 8/24. Sign up for a free sample of Nectresse 100% Natural No Calorie Sweetener made from Monk Fruit. Anybody tried this yet??? I like to sign up for these because a lot of times they include a high value coupon for the product too. Who's using a Topsy Turvy to grow tomatoes this year? I got some Topsy Turvy's last year on woot.com for $1 each, I've been wanting to try them but didn't want to spend a fortune on them so I grabbed a few when I found them for $1 (sorry they are all gone). I put some tomato plants in them this spring, check em out. How are your tomato plants doing?